The humor development technique (process) that I will cover in this lesson is very different from any others and is highly effective. Here are the steps to this process. 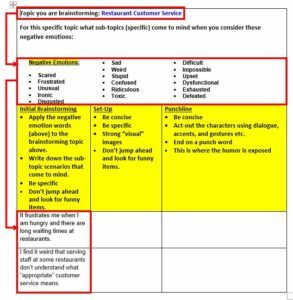 Using the template table, identify specific sub-topics that come to mind while you ponder the listed negative emotions. 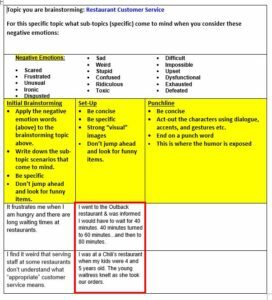 In the left-hand column, summarize the negative emotion and sub-topic combination (based on personal experience, observations, and/or premise). 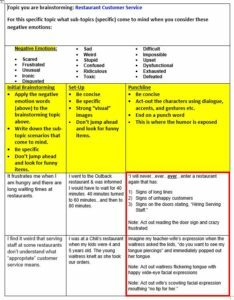 In the center column, describe the specific relatable scenario, personal experience, observation, or premise relating to the negative emotion. Make the set-up detailed and full of visual images. Revise, revise, and revise some more to make it concise. Notes: The set-up simply provides information the audience needs to know to understand the scenario. It can be more effective when it is conveyed in the form of a question to which you know the audience will relate. The set-up should be as brief as possible and should not include humor, which is revealed in the punchline. In the right-hand column, list the punchline by describing any ridiculousness, irony, or twists to the set-up. 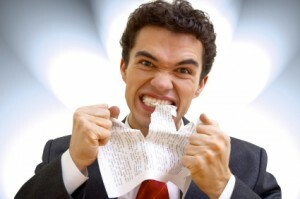 Act-out your funny emotional reaction and add embellishment. Use the Humor Rule of Three technique if possible. Revise, revise, and revise some more to make it concise and visually descriptive. Build on the humor by including a series of relatable additional punchlines if possible. Note: Keep it believable…do not “force the funny” or it will diminish the potential for audience laughter. Before we go any further, spend some time scrolling through and studying this example and make sure you have a clear understanding of the process to populate each of the three columns. We have now explored the full process of identifying humor related to negative emotions for a specific topic. It is important to understand that once you fill in the table, you are not finished. It may take hours, days, weeks, months, or even years to keep it evolving and identify more and more humor potential items. (This is the fun part for me!) As I mentioned in the intro video, this takes time. Go at your own pace.